Trip tip: Bring a kayak cart. The parking is a few hundred yards from the access. Geological history states that this lake was once part of the former Mohawk River before changing course to its present more easterly path. This history is clarified as you paddle along the high banks of the straight, narrow southern section. The scenery is a mix of waterfront homes and wetland areas. Great Blue Herons can be spotted along the lake. As a result of being located on the Saratoga-McGregor fault zone, numerous springs rich in iron and other minerals, feed the bottom of the lake. These springs are similar to the famous and popular mineral springs of Saratoga Springs. 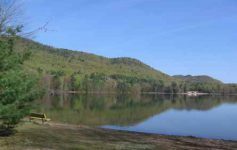 The northern end of the lake has a parking area, fishing pier and hand launch for access to the three and a half mile body of water. The deepest point of 120 feet is at the southern end of the lake. 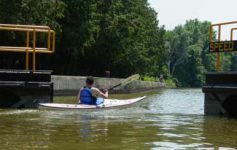 Since Outlet Road is the only public access, paddling the entire distance to the southern shoreline and back, will take about two hours on a calm day. Excellent sport fishing opportunities exist and there always seems to be a crowd of people fishing around the bridge on Outlet Road. Indians who traveled along this historic trade route, referred to the lake as Shenantaha, which means “deer waters”. 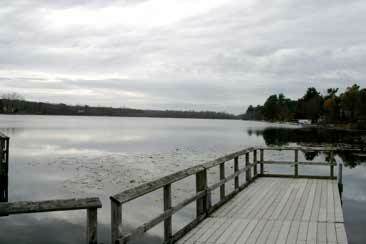 The white settlers followed and named it Long Lake until renaming it Ballston Lake after Reverend Eliphaler Ball. Reverend Ball was one of the early settlers and built a log cabin up off to the northwest of the lake up on the hill. Outlet Rd is located 9.5 miles south of Saratoga Springs off of Route 50. Go through Ballston Spa to the traffic light at Outlet Road. In Ballston Spa stop at the Wild Thyme Food & Tea Co. to pick up an energy drink before hitting the trail. The Good Times Café sign is a good landmark marking Outlet Road. Continue east on Outlet Rd. The trailhead is on the right just before you go over the railroad tracks, although the parking area is a few hundred yards down the road on the left. The parking area is large enough for plenty of vehicles and has one picnic table.